Dr. Cox helping lower back disc injury patient. Herniated discs can become very painful causing tremendous neck or back pain, in addition to pain to the legs/thighs/feet and/or arms/forearms/hands. Cox Decompression Therapy is a method of chiropractic care that targets the discs in the spine for effective treatment. The Cox technique is very gentle method and works with the body’s natural design to relieve pain. We use Cox therapy to gently widen the space where the disc resides reducing pressure on the spinal nerves and restoring normal motion of the spine. The Cox table is a unique piece of equipment. PGA Chiropractic is one of only a few clinics in the South Florida area to have a Cox Flexion/Distraction Decompression table for helping with injuries to the neck and back. Cox therapy has been helping patients for over 60 years with numerous published studies showing its efficiency. It is taught at all chiropractic colleges in the United States and the table can even be found at some of the most prestigious medical teaching facilities in the world. Cox Decompression therapy is done by hand and by Dr. Cima only. The doctor is always present during the treatment and in full control of the procedure. Dr. Cima will constantly monitor the comfort level and adjust the amount of “stretching force” base on the patient’s input. Cox Decompression therapy is very precise. It treats the specific level of injury in the spine, targeting it for improvement. Over the past 25 years, thousands of patients in our Palm Beach Gardens office have received positive results with the Cox Decompression Technique for their spinal injuries. Cox technique can also be helpful for other conditions as well as disc injuries. Many conditions respond very well to Cox Decompression Technique. 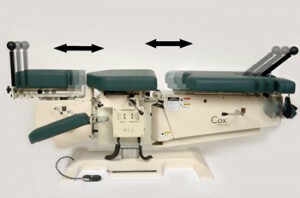 Cox table separates gently for healing decompression therapy. Does Insurance Cover Cox Technique? If your insurance includes coverage for chiropractic spinal manipulation, it will cover Cox therapy treatment. We will let you know prior to starting care what your insurance covers. We’d love to meet you and answer your questions. Give PGA Chiropractic Health Center a call today!